Warning: there are enough English language Buddhist sites around without me adding still one more. The only English language papers you'll find here are here for the sake of usefulness, when they are not (or no longer) available anywhere else. Is the world evenly gray? One of my penpals says that the world is grey. This brings me back to what says Nishijima Roshi: He had thought that if the Buddha's teachings only meant that the world is nothing but suffering, he needed not trouble himself, we had noticed. A little while ago, I had one of my pupils (in French) notice that the world is a marvel, but also an infection. Our problem is, we need to learn and discover and tame such marvel, whereas the infection needs no medium to impose itself upon us. If we can't learn and appreciate those moments of bliss, we shall only see the uncounted horrors which swarm about us, with so few moments of respite. The world is grey but in a statistical way. In a black and white image with a correct definition, one goes from black to white through levels of grey uncounted. In a colour image, we get through the whole gamut of colours that range from the ultraviolets to the infrareds. But there are cultures where no specific word exists that differentiate blue from green. In Gaelic, both Scottish and Irish, the word "gorm" stands for both. In Japanese, "aoi" does the same service. Does this mean that they don't differentiate between blue and green? Of course not. It only means that, in order to express them, they shall resort to various artifices. Not being able to express them does not allow us to reduce them to grey. The world is beautiful, the world is ugly. The world is neither beautiful nor ugly. The world is both beautiful and ugly. The world is neither not beautiful nor not ugly. It is. What is left is our appreciation of the fact. It might be a good thing to look at it. 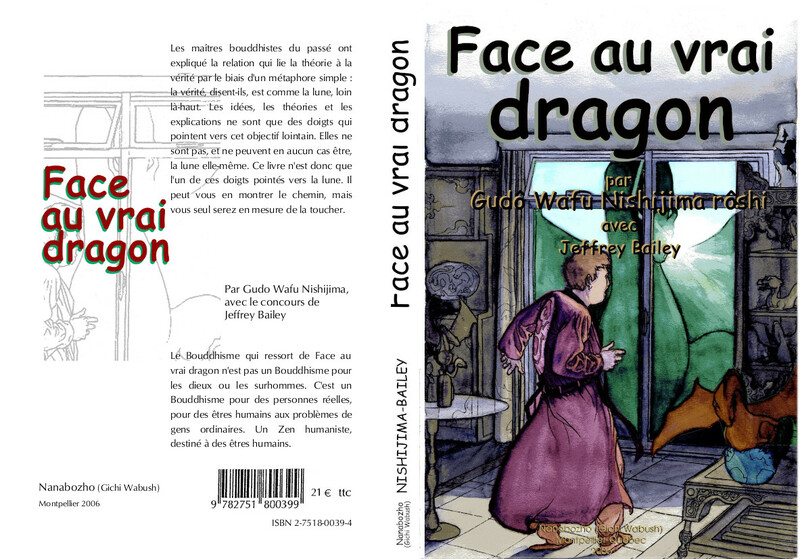 My translation of Nishijima Roshi's book, "To Meet the Real Dragon", in French Face au vrai dragon, is available here. It is also on Amazon. Don't forget that the pages "Growing up a Lotus" has been reorganised and added to. Growing a Lotus : A series of exercises for easing up the posture. Too often does the practice seem so difficult, if not straightaway impossible for whom is not used to sitting on the ground, and who get very soon aching knees. This has discouraged more than one to keep on practicing the essential practice of sitting. This helps to make things better. Master Gudo : Look over some of Master Nishijima's most important references, especially his theory of three philosophies and one reality. Papers : Some recent papers. Translations into French of papers in English, various original French language papers, and some personal ravings. Sôtô Zen Ancestors : A very important American site.. Soto Zen is deeply rooted in the Chinese history of the Tang. Tô (Dong) -- that is to say East-- refers to Dongshan Liangjie, a contemporary and an acquaintance to Mazu Daoyi, himself the origin of the Rinzai Rinzai (Linji) lineage, which is by the way that of Thich Nhat Hanh. Although most interpretations ascribe the Sô (Cao) to one of Dongshan Liangjie's students, a minority ascribe it to the monastery of Caoqi, that of the Sixth Patriarch, Huineng. I believe the latter to be more likely, since Caoshan (Dongshan's student) had no Dharma following, and also because Cao appears first, which would be logical if it stood for Caoqi. Access to Insight : The Pali Canon contains some of the most ancient texts of Buddhism. In those texts may one read what's nearest to the Buddha's very words. Mahâyana Sûtras : Mahayana Buddhism produced lots of texts built up on the general model of the ancient canonical sutras. Those are as a rule more verbose and filled with marvelous things, more than in the original texts. They are nevertheless Buddhist discourses, often very useful if we want to understand some later developments of Buddhism, as well as not getting trapped by a too litteral interpretation of the canonical texts. Although the Buddha never pronouced them, really, on a historical level, it would not be correct to say they are not the Buddha's word. Humour : A collection of Buddhist humour translated into French, and mostly though not exclusively Zen. Gallery : Modern and antique portraits and iconography within a Mahayana Buddhist thematic. Links : A few links towards other sites.